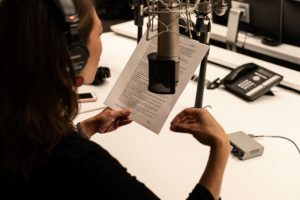 There is no perfect template for a radio intro. In fact, that’s the point: Intros should surprise you. They should grab your ear and demand you listen, in part, because they don’t all sound the same. And of course, in a news program, they should tell you — clearly — what a story is about. How to do that — and do it well — is a daily struggle. In other words, whet the appetite; don’t satisfy it. I’ll say it again: read your intro out loud. Make sure you can read it and sound natural, like you’re describing the story to a friend or your mom. Better yet, before you write your intro, say it. Then type. Too much editing time is wasted turning print-style intros into spoken language. If you’re gasping for breath, your sentences are too long. If you’re using words you’d never use when you speak, such as “retailers” or “numerous,” change them. A lot of intros get caught in the trees and miss the forest. They tell us three important facts about what happened today in the Middle East (“10 people were killed in a bombing; this group took responsibility; the foreign country where it happened is on high alert”), but they fail to explain why it matters or why listeners should stick around to hear more. Sometimes the “why” is one sentence describing the broader significance of the event. But sometimes the “why” is a storytelling technique. Including compelling tape in the intro can make people care. Introducing us to a character can make people care. Inviting us to a provocative debate can make people care. In other words, there are lots of ways to make people want to listen. Pick yours. It’s often said that an intro is a promise to listeners. The promise can be the angle you choose, the journey you propose or the question you intend to answer. Just because your broad topic is “today’s violence in the Middle East” doesn’t mean you’ll achieve full coverage of that in four minutes. But you could deliver a satisfying story about one person who’s trying to negotiate peace, or one town affected by the violence, or one aspect of an ongoing debate (e.g. : “As NPR’s Mark McGuffin tells us, Egyptians are debating the balance between security and democracy”). If that’s what your story has to offer, be transparent with the listener so they don’t expect something different. And then make sure your story delivers on that promise (like NPR’s Aarti Shahani does here). This rule is constantly preached but frequently broken. The intro is the first thing listeners hear and it should be the first thing you write. For the audience, the story begins to unfold from the minute the host begins reading your intro, not the moment when your voice appears. So however you structure your narrative, don’t consider the intro the icing on top or the dumping place for facts you couldn’t fit into your story. That’s a recipe for listeners turning off the radio or skipping your story on NPR One. “Putting too many ‘buts’ in an intro leaves the listener unsure what the piece is about. We are just absorbing one piece of information when we’re presented with another one that effectively undercuts it.